Madhvacharya was the third of the trinity of philosophers who influenced Indian thoughts after the ages of the Vedas and Puranas. He came after Sri Shankaracharya and Shri Ramanujacharya. He propounded the philosophy of Dwaita or Dualism. His knowledge and intellect were such that he defeated many scholars belonging to other faiths. Some of the scholars he defeated became his disciples. One of them, Narahari Tirtha gave Madhvacharya an ancient Idol of Sri Rama. This was the famous Moola Rama of the Ragavendhra Swami Matha. Madhvacharya wrote commentaries on several important Hindu holy texts, including the Bhagavad Gita and the Brahma Sutra. These commentaries gave brilliant dualistic interpretations to the same works that Sri Shankara had seen as stressing on Advaita (non dualism). He wrote various texts that detailed his philosophy which he called Tattvavada, or as it is more popularly known, Dvaita. Some of his works were the Gita Bhashya, Brahma Sutra Bhashya, Anu Bhashya, Karma Nirnaya, and Vishnu Tattva Nirnaya. 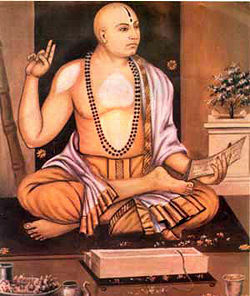 Sri Madhvacharya was born in the Udupi region and he was educated in the Mutt associated with the Ananteshwara Temple. Udupi is now famous for the beautiful Krishna Temple and it was Madhvacharya who established this temple. There is an interesting story as to how he got that Krishna Idol. One day, Madhvacharya was on the seashore performing his daily rituals, when he spotted a ship in trouble. He guided the ship safely to harbor and the grateful ship captain thanked him and requested him to take anything he wanted from the ship. Sri Madhvacharya chose three large lumps of Gopi Chandana as he knew instinctively that in one of these mounds, there was a beautiful idol of the Baby Krishna. He found the idol and consecrated it in a temple and personally worshipped it for 20 years. This temple is now one of the most famous Krishna Temples in India. He chose eight young Sanyasis to become the pontiffs of eight mathas he setup around the temple. These eight Mathas were assigned the duty of administering the temple, in rotation of two months each. This system, known as Paryaya was modified in the 16th century by Sri Vadiraja to extend to two years each. This rotational system of administration continues till now. The basic tenet of Dvaita philosophy is the refutation of the Mayavada of Sri Shankara. Dvaitha emphasizes that the world is real and not just an illusion. Madhvacharya was a social and religious reformer who declared that the path to salvation was open to all and was not limited by birth. His teachings attracted many followers and revived the Bhaghavatha or Bhakthi traditions in Karnataka.